Like a jargon-heavy book that keeps making you flip to the glossary in the back, the Academy City Underworld arc was so laden with groups, individuals, motives and goals that I had to refer to the Index wiki on more than one occasion just to find out who the hell some of the people were. As a result, it was hard to sit back and just enjoy the action. So thank goodness this week is a far simpler Index episode (even though it takes a number of turns), featuring a straightforward plot and familiar, beloved characters. It certainly starts out where Kamijou Touma would prefer to be, at school, where the most fraught action is being chased by a burly teacher when he and Tsuchimikado are the only two able to escape school to get to the convenience store for the lunch they want. For all the misfortune swirling around him, Touma does catch a break every once in a while. In this case, a very lovely break in the person of Itsuwa, who mistakes Saigo for a hostile and takes him out for Touma. She’s come to A.C. to serve as Touma’s bodyguard due to stirrings that the powerful Saint Acqua of the Back (or Rear) is going to target him. The rest of Amakusa is there to back Itsuwa up, as well as to try to get her to pull the trigger on Touma, whom she apparently likes. In this venture it’s Itsuwa who is more unfortunate, since she must contend with the jealousy of Biribiri, who makes a welcome return to the show. Misaka was actually concerned that Touma had amnesia, only to catch him deep in Itsuwa’s bust. Thankfully, Touma manages to keep Itsuwa from mistaking her for a hostile…even though she kinda is! 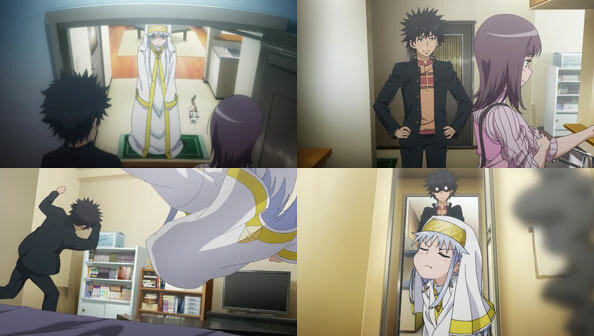 This also marks the rare Index III episode that actually has sizable portions of Index in it, as she watches with concern as Itsuwa enters her and Touma’s home, buys the loyalty of Sphinx with some high-quality bonito, and starts making dinner. Like living a simple high school life with occasionally exciting lunch runs, just seeing a girl in his kitchen making dinner gives him no end of joy. The fact that Itsuwa is acting like a proper house guest and helping out exposes how comparatively little his other guest Index does. Of course, the reason Index doesn’t help out is that her help often only causes more work, such as when she pours an entire bottle of drain cleaner down the shower and almost causes a fire. Itsuwa cuts off their ensuing dust-up, rents a motorcycle and sidecar, and takes Touma and Index to a splendid public bathhouse in the 22nd School District, which is entirely underground yet has a giant screen in its “sky” projecting the real sky. It’s a really beautiful motorcycle ride that shows yet another side of the sprawling city. Naturally, Misaka ends up in the same bath as Index and Itsuwa, and as Itsuwa clumsily tries to explain how Touma came to end up in her breasts she then becomes the target of Index’s ire, while Biribiri stews until she overheats and a medical team with a stretcher has to be called. 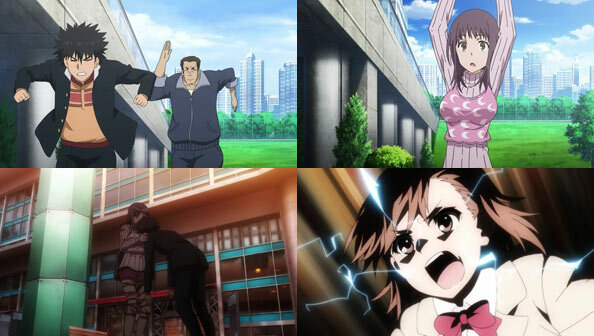 I presume Misaka had to be temporarily taken out of comission in order to lend more peril to the final act of the episode. Touma and Itsuwa go on what could be construed as a romantic evening constitutional, but once they reach the bridge (Touma and bridges don’t mix! ), Acqua suddenly appears, and wastes no time mopping the floor with the both of them. 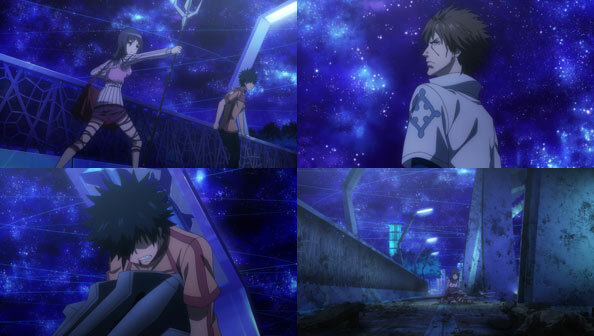 Itsuwa is a strong and honorable bodyguard, but she simply has no chance against a Saint, and her restoration spells have limited effect on Touma due to his right arm. About that arm: Acqua will let him live if he cuts it off and gives it to him. He couldn’t care less about Kamijou Touma, he wants Imagine Breaker taken out of the equation of church and global affairs. In his surpassing charity, Acqua doesn’t simply take what he wants, even though he’s certainly capable of doing so (unless Imagine Breaker somehow prevents the arm from being separated from Touma’s body). He gives Touma one day to decide whether he’ll give it up willingly, or die. And since Itsuwa is his sworn bodyguard, she and the rest of Amakusa will certainly die defending him before he does. So yeah, a Saint with the Right Hand of God either wants Touma’s arm or his life, and Itsuwa alone won’t be enough to stop him. Like I said, straightforward! I imagine one needs a Saint to fight a Saint, so we’ll see if Kanzaki enters the fray…not to mention Misaka once she recovers from overheating in the bath.